Difference between revisions of "Infiltration chambers"
*Layers of [[Reservoir_gravel|coarse aggregate]] to bed the chambers and redistribute water. This is an image map; clicking on components will load the appropriate article. The maximum total depth will be limited by construction practices i.e. usually ≤ 2 m.
The maximum total depth may be limited by the conditions underground e.g. the groundwater or underlying geology/infrastructure. The minimum total depth may be limited by the need to support vegetation i.e. not < 0.6 m.
Green roofs, absorbent landscapes and permeable paving often receive very little flow from other surfaces, so that the I/P ratioThe ratio of the catchment (impervious area) to the footprint area of the receiving BMP (pervious area). is close to 1. 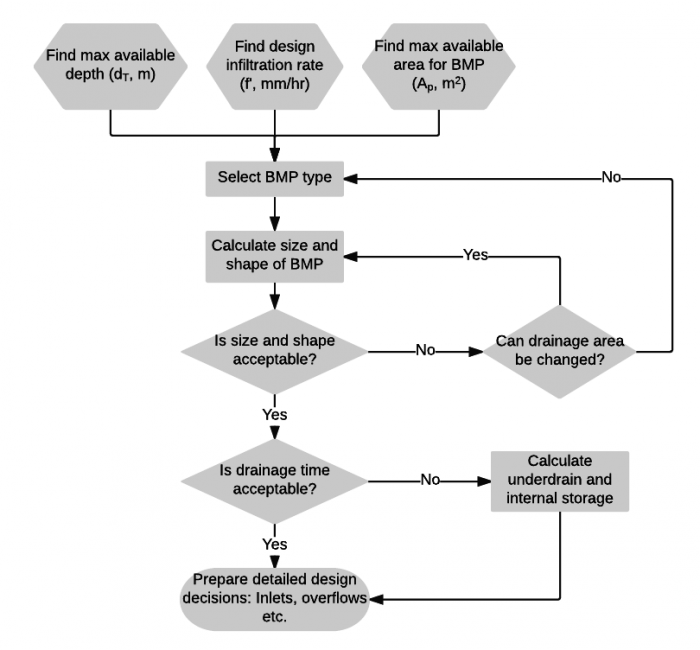 Infiltration trenches, chambers and bioretention have a maximum recommended I/P ratioThe ratio of the catchment (impervious area) to the footprint area of the receiving BMP (pervious area). of 20.
n - Porosity, as measured (or default to 0.35 for all aggregatesA broad category of particulate material used in construction, including sand, gravel, crushed stone, slag, recycled concrete and geosynthetic aggregates, and available in various particulate size gradations.). *Note: For systems that have significant storage in clear open chambers, an effective porosity value (n') may be estimated for the whole installation and used in the calculations below. Effective porosity will vary according to the geometry of the storage chambers, so advice should be sought from product manufacturers. Permit applications should include the basis for n' estimates. I m2 Impermeable area i.e. catchmentThe land draining to a single reference point (usually a structural BMP); similar to a subwatershed, but on a smaller scale. d m depth of infiltration facility or BMPBest management practice. State of the art methods or techniques used to manage the quantity and improve the quality of wet weather flow. BMPs include: source, conveyance and end-of-pipe controls. P m2 Permeable area i.e. footprint area of the facility or BMPBest management practice. 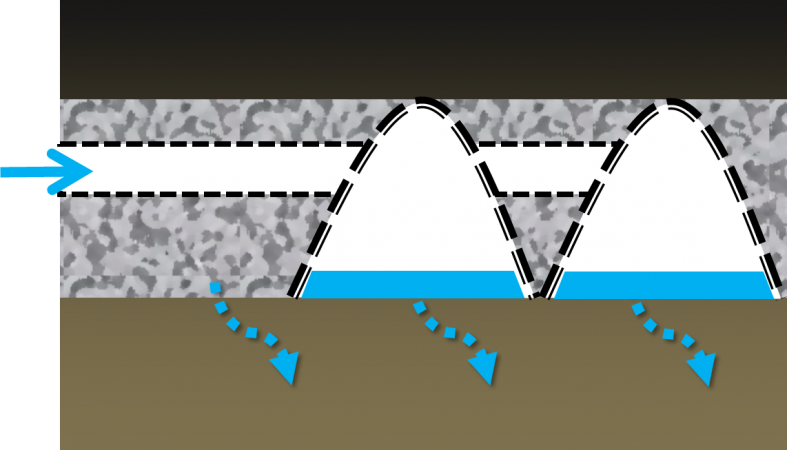 State of the art methods or techniques used to manage the quantity and improve the quality of wet weather flow. BMPs include: source, conveyance and end-of-pipe controls. In some very constrained sites, the surface area of the BMPBest management practice. State of the art methods or techniques used to manage the quantity and improve the quality of wet weather flow. BMPs include: source, conveyance and end-of-pipe controls. may be limited, in this case the required depth of cell or trench can be calculated. Note that in most cases the results of this calculation will be very similar to those of the above equation using 3D infiltrationThe slow movement of water into or through a soil or drainage system.Penetration of water through the ground surface..
Three footprint areas of 9 m2. The target drawdown time for the internal storage of an infiltration facility is between 48-72 hours. For some geometries (e.g. particularly deep facilities or linear facilities), it preferable to account for lateral infiltrationThe slow movement of water into or through a soil or drainage system.Penetration of water through the ground surface.. The 3D equation make use of the hydraulic radius (P/x), where x is the perimeter (m) of the facility. This is a collection of three articles with the common theme of being aggregateA broad category of particulate material used in construction, including sand, gravel, crushed stone, slag, recycled concrete and geosynthetic aggregates, and available in various particulate size gradations. products for various applications in LIDLow Impact Development. A stormwater management strategy that seeks to mitigate the impacts of increased urban runoff and stormwater pollution by managing it as close to its source as possible. It comprises a set of site design approaches and small scale stormwater management practices that promote the use of natural systems for infiltration and evapotranspiration, and rainwater harvesting.. Underground construction aggregatesA broad category of particulate material used in construction, including sand, gravel, crushed stone, slag, recycled concrete and geosynthetic aggregates, and available in various particulate size gradations. 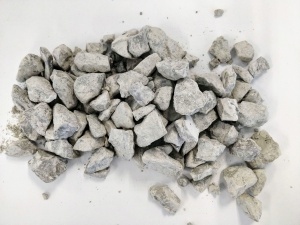 medium sized granularGravel, or crushed stone of various size gradations (i.e., diameter), used in construction; void forming material used as bedding and runoff storage reservoirs and underdrains in stormwater infiltration practices., free from finesSoil particles with a diameter less than 0.050 mm. In bioretention systems a choking layer of ≥ 100 mm is the recommended method to prevent migration of finer filter media into an underlying reservoir of coarse aggregate. These same mid sized granularGravel, or crushed stone of various size gradations (i.e., diameter), used in construction; void forming material used as bedding and runoff storage reservoirs and underdrains in stormwater infiltration practices. materials are recommended for use in Stormwater planter underdrains and may be useful in the fine grading of foundations courses for permeable paving. Clean, angular aggregateA broad category of particulate material used in construction, including sand, gravel, crushed stone, slag, recycled concrete and geosynthetic aggregates, and available in various particulate size gradations. screened to between 6 - 10 mm. Widely available and designed specifically for drainage applications. Free from finesSoil particles with a diameter less than 0.050 mm. by definition. Is a clean, angular aggregateA broad category of particulate material used in construction, including sand, gravel, crushed stone, slag, recycled concrete and geosynthetic aggregates, and available in various particulate size gradations. screened between 10 - 20 mm. Free from finesSoil particles with a diameter less than 0.050 mm. by definition. Rounded natural aggregateA broad category of particulate material used in construction, including sand, gravel, crushed stone, slag, recycled concrete and geosynthetic aggregates, and available in various particulate size gradations., screened between 5 - 15 mm, and washed free from finesSoil particles with a diameter less than 0.050 mm.. In most scenarios, a geotextile layer is unnecessary and have been associated with rapid decline and clogging in some circumstances. OPS AggregatesA broad category of particulate material used in construction, including sand, gravel, crushed stone, slag, recycled concrete and geosynthetic aggregates, and available in various particulate size gradations. Of the standard granularGravel, or crushed stone of various size gradations (i.e., diameter), used in construction; void forming material used as bedding and runoff storage reservoirs and underdrains in stormwater infiltration practices. materials in the standard OPSS.MUNI 1010 only GranularGravel, or crushed stone of various size gradations (i.e., diameter), used in construction; void forming material used as bedding and runoff storage reservoirs and underdrains in stormwater infiltration practices. O is recommended as a substitute for clear stone in LIDLow Impact Development. A stormwater management strategy that seeks to mitigate the impacts of increased urban runoff and stormwater pollution by managing it as close to its source as possible. It comprises a set of site design approaches and small scale stormwater management practices that promote the use of natural systems for infiltration and evapotranspiration, and rainwater harvesting. construction. Where GranularGravel, or crushed stone of various size gradations (i.e., diameter), used in construction; void forming material used as bedding and runoff storage reservoirs and underdrains in stormwater infiltration practices. O is substituted for clear stone in underground reservoir structures, the void ratio used in design calculations shall be 0.3 unless laboratory testing proves otherwise. Examples of BMPs with underground reservoirs include Underdrains, infiltration trenches, permeable paving, infiltration chambers, exfiltration trenches. All other mixes must be avoided for free drainage or storage as they are permitted to contain a higher enough proportion of finesSoil particles with a diameter less than 0.050 mm. to reduce permeability below 50 mm/hr. Landscaping aggregatesA broad category of particulate material used in construction, including sand, gravel, crushed stone, slag, recycled concrete and geosynthetic aggregates, and available in various particulate size gradations. This rain gardenA lot level bioretention cell designed to receive and detain, infiltrate and filter runoff, typically used for discharge from downspouts. in a school yard uses stone as both decorative edging and for erosion controlIncludes the protection of soil from dislocation by water, wind or other agents.. 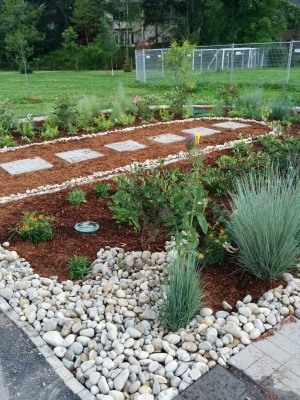 This bioswaleLinear bioretention cell designed to convey, treat and attenuate stormwater runoff. The engineered filter media soil mixture and vegetation slows the runoff water to allow sedimentation, filtration through the root zone, evapotranspiration, and infiltration into the underlying native soil. 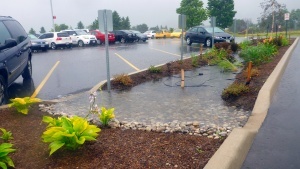 in a parking lot uses stone at the inlets and along the bottom of the swaleA shallow constructed channel, often grass-lined, which is used as an alternative to curb and channel, or as a pretreatment to other measures. Swales are generally characterized by a broad top width to depth ratio and gentle grades. to prevent erosion(1) The wearing away of the land surface by moving water, wind, ice or other geological agents, including such processes as gravitation creep; (2) Detachment and movement of soil or rock fragments by water, wind, ice or gravity (i.e. Accelerated, geological, gully, natural, rill, sheet, splash, or impact, etc)., as the sides are sloped. For advice on aggregatesA broad category of particulate material used in construction, including sand, gravel, crushed stone, slag, recycled concrete and geosynthetic aggregates, and available in various particulate size gradations. used in underdrains, see Reservoir aggregate. Stone or gravel can serve as a low maintenance decorative feature, but it may also serve many practical functions on the surface of an LIDLow Impact Development. A stormwater management strategy that seeks to mitigate the impacts of increased urban runoff and stormwater pollution by managing it as close to its source as possible. It comprises a set of site design approaches and small scale stormwater management practices that promote the use of natural systems for infiltration and evapotranspiration, and rainwater harvesting. practice. Stone for erosion controlIncludes the protection of soil from dislocation by water, wind or other agents. AggregatesA broad category of particulate material used in construction, including sand, gravel, crushed stone, slag, recycled concrete and geosynthetic aggregates, and available in various particulate size gradations. used to line swales or otherwise dissipate energy (e.g. in forebays) should have high angularity to increase the permissible shear stress applied by the flow of water. 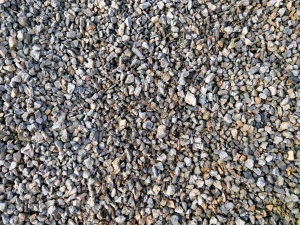 However, in some surface landscaped applications there may be a desire to use a rounded aggregateA broad category of particulate material used in construction, including sand, gravel, crushed stone, slag, recycled concrete and geosynthetic aggregates, and available in various particulate size gradations. such as 'river rock' for aesthetic reasons. Rounded stones should be of sufficient size to resist being moved by the flow of water. Typical stone for this purpose ranges between 50 mm and 250 mm. The larger the stone, the more energy dissipation. Stone beds should be twice as thick as the largest stone's diameter. If the stone bed is underlain by a drainage geotextile, regular inspection and possible replacement should be scheduled as there is a potential for clogging of this layer to occur. Stone mulcha top dressing over vegetation beds that provides suppresses weeds and helps retain soil moisture in bioretention cells, stormwater planters and dry swales. Specifying that aggregates for the construction of LIDLow Impact Development. A stormwater management strategy that seeks to mitigate the impacts of increased urban runoff and stormwater pollution by managing it as close to its source as possible. 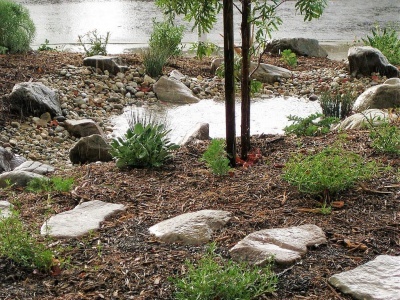 It comprises a set of site design approaches and small scale stormwater management practices that promote the use of natural systems for infiltration and evapotranspiration, and rainwater harvesting. practices must be free from finesSoil particles with a diameter less than 0.050 mm. is important. But checking that the delivered materials meet specification is essential to reduce problems with construction and longer term performance. When possible, Construction Managers should observe the offloading of materials to watch for dust clouds. AggregatesA broad category of particulate material used in construction, including sand, gravel, crushed stone, slag, recycled concrete and geosynthetic aggregates, and available in various particulate size gradations. or sand for LIDLow Impact Development. A stormwater management strategy that seeks to mitigate the impacts of increased urban runoff and stormwater pollution by managing it as close to its source as possible. It comprises a set of site design approaches and small scale stormwater management practices that promote the use of natural systems for infiltration and evapotranspiration, and rainwater harvesting. construction should not give rise to clouds of dust when dumped. A simple jar test can be used to gauge the proportion of finesSoil particles with a diameter less than 0.050 mm. in an aggregateA broad category of particulate material used in construction, including sand, gravel, crushed stone, slag, recycled concrete and geosynthetic aggregates, and available in various particulate size gradations. product before acceptance. The aggregateA broad category of particulate material used in construction, including sand, gravel, crushed stone, slag, recycled concrete and geosynthetic aggregates, and available in various particulate size gradations. to be tested. Note that the sedimentSoil, sand and minerals washed from land into water, usually after rain. They pile up in reservoirs, rivers and harbors, destroying fish-nesting areas and holes of water animals and cloud the water so that needed sunlight might not reach aquatic plans. Careless farming, mining and building activities will expose sediment materials, allowing them to be washed off the land after rainfalls. may collect on top of, or at the bottom of the construction material. Two points (or 1 point for Healthcare) will be awarded if the project manages "the runoffThat potion of the water precipitated onto a catchment area, which flows as surface discharge from the catchment area past a specified point.Water from rain, snow melt, or irrigation that flows over the land surface. from the developed site for the 95th percentile of regional or local rainfall events." Three points (or 2 points for Healthcare) will be awarded if the project manages "the runoffThat potion of the water precipitated onto a catchment area, which flows as surface discharge from the catchment area past a specified point.Water from rain, snow melt, or irrigation that flows over the land surface. from the developed site for the 98th percentile of regional or local rainfall events." For zero-lot-line projects only, 3 points (or 2 points for Healthcare) will be awarded if the project manages "the runoffThat potion of the water precipitated onto a catchment area, which flows as surface discharge from the catchment area past a specified point.Water from rain, snow melt, or irrigation that flows over the land surface. from the developed site for the 85th percentile of regional or local rainfall events."